PRG was asked to create a strong, positive visual identity for Eastbourne Borough Council’s Bourne to Recycle household waste recycling scheme. A strategic approach was needed to ensure that the branding was eye catching and engaged its key audience. 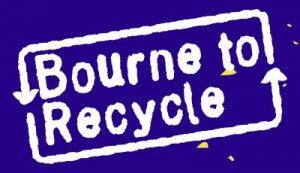 We have seen many recycling awareness campaigns come and go and it was felt that Bourne to Recycle needed to be a bit different. This needed to be a bright, bold, positive campaign focusing on what recycling can do for the homeowner and their community. PRG chose a bold statement font, teamed with a very visually recognisable image to create daringly unfussy branding. The wording focussed on the positive aspects of recycling, using simple language to convey concise, yet important messages. PRG also introduced a bright and optimistic colour pallet to challenge initial perceptions of recycling campaigns and drive home the points of difference with Bourne to Recycle. Chris Connelley, Recycling Rewards Co-ordinator said; “We have been working with PRG over the course of the last few months to develop our new recycling rewards brand, Bourne to Recycle, and have benefitted from their set of consummately professional services which have taken us from an original concept through to the derivation of a strong visual identity that works well in a range of settings and over a number of platforms. “Put simply, PRG are very good at what they do, listening carefully, questioning wisely and consistently delivering inventive and impactful copy that is consistent with, and builds on, those early conversations. Call us on 01323 411044 to discuss how we can bring your brand to life or email us your enquiry.